We are Christians. Not perfect, just forgiven. The Christian fish is often used to identify Christians to other Christians. It was used discreetly when Christians were being persecuted in the early church. 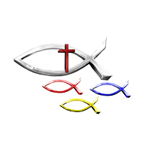 Christians in need of safe shelter or wanting fellowship could identify others easily using this little fish symbol.